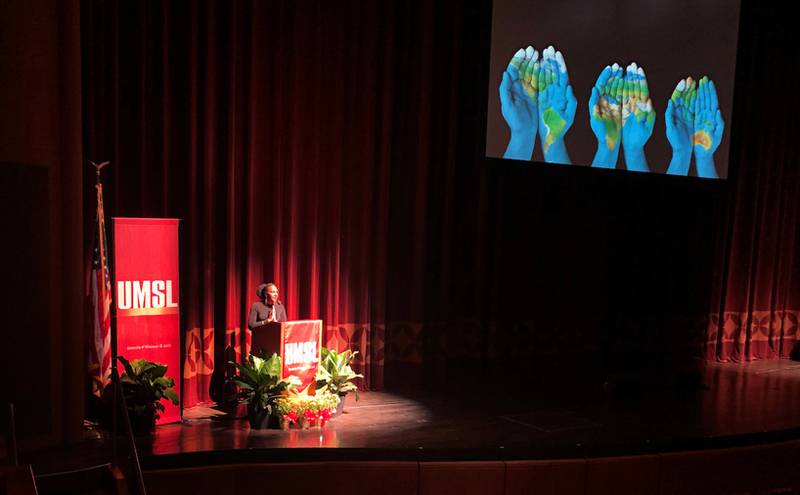 Whytney Clay connected the legacy of Martin Luther King Jr. to contemporary events she read aloud during the annual holiday observance of the great civil rights leader’s birthday Monday on the campus of the University of Missouri–St. Louis. 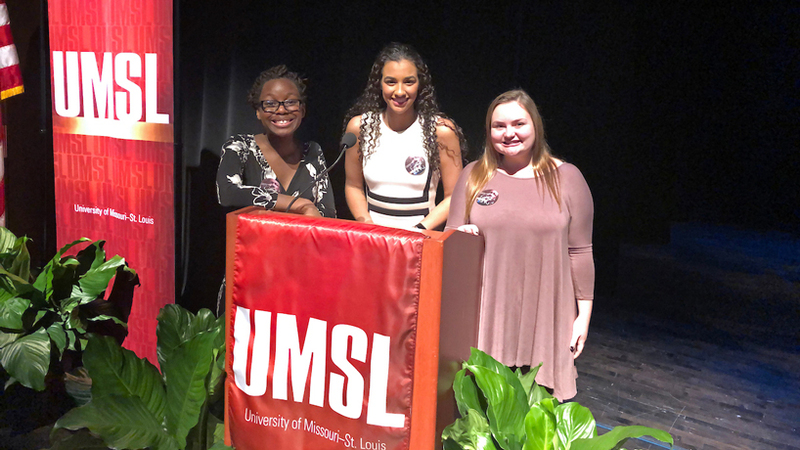 Clay joined senior Victoria Franklin and freshman Lucy Grimshaw addressing the crowd as 2019 recipients of the UMSL Martin Luther King Jr. Scholarship. 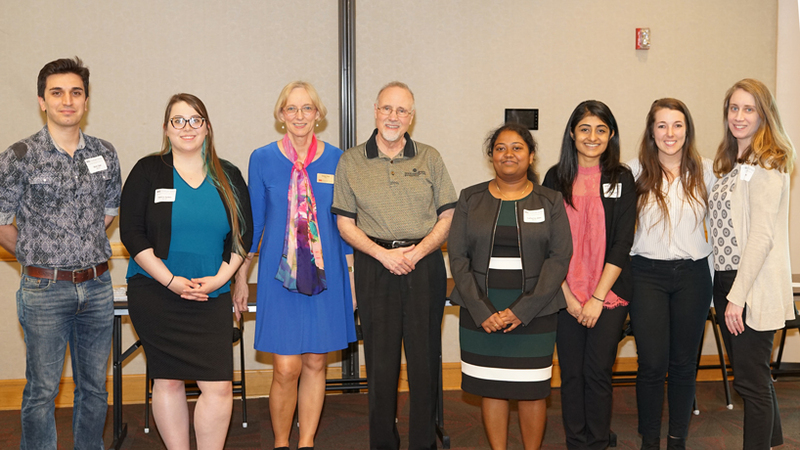 The $500 scholarship, first awarded in 2010, recognizes excellence in scholarship and service by UMSL undergraduates. To be considered, students must have at least a 2.5 GPA and be actively participating in community service. Clay has volunteered at SSM St. Mary’s Hospital, the St. Louis Area Foodbank and as a peer tutor at UMSL. Franklin, a biochemistry and biotechnology major, did work at TEAM Food Pantry in Florissant during the fall semester and the Oxford Lafayette Humane Society and Mississippi State Veterans Home of Oxford a year ago while a student at the University of Mississippi. Grimshaw, who plans to major in public policy and minor in social work, went on a mission trip to Haiti while still in high school and has volunteered with Girls on the Run and Litzsinger School. Activist Bree Newsome delivers the keynote address during Monday’s Martin Luther King Jr. Holiday Observance at the Blanche M. Touhill Performing Arts Center. A committee selected Clay, Franklin and Grimshaw from a group of 23 applicants, not only because of their academic performance and community involvement but also because of the quality of their essays in response to King’s speech “A Christmas Sermon on Peace” as part of the application. None had heard the address, delivered on Dec. 24, 1967 from Ebenezer Baptist Church in Atlanta, Georgia, before deciding to write their essays to apply for the scholarship. Grimshaw, specifically, found herself drawn to its message of advocacy. Franklin focused on King’s message of the interconnectedness of all people. “He talks about how much we will never reach peace on earth unless we realize we all depend on each other in our communities and across the world,” Franklin said. 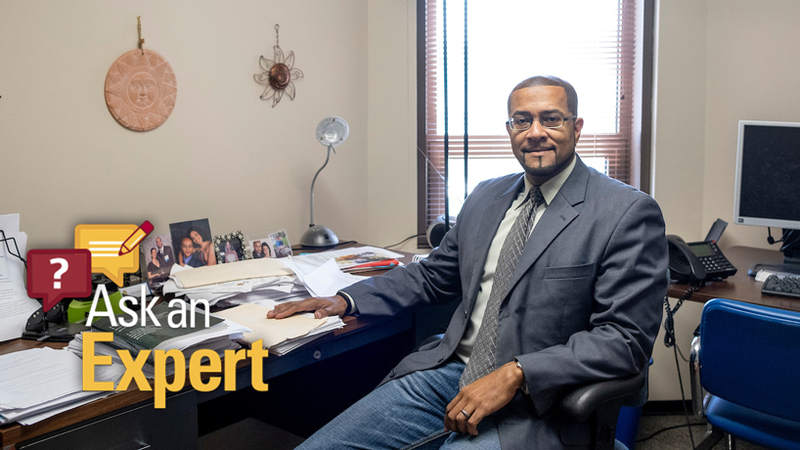 UMSL alumnus Brian Owens, the Des Lee Fine Arts Collaborative Community Music Artist in Residence, and Compositions for LIFE perform “The Gibson Suite” during Monday’s Martin Luther King Jr. Holiday Observance. 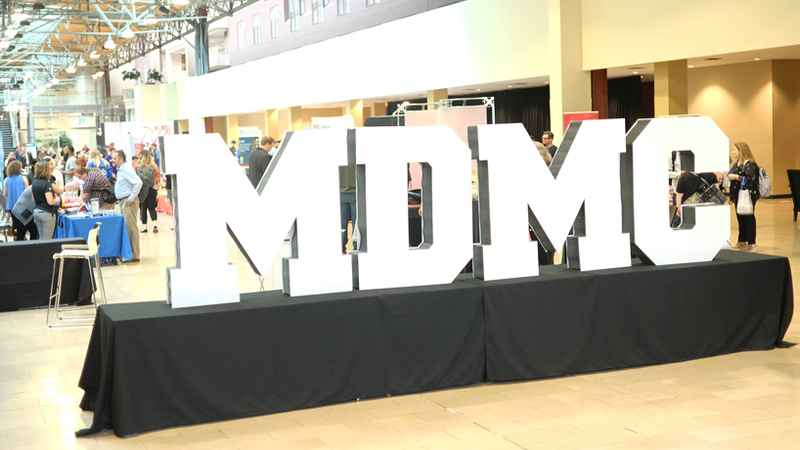 Their essays were only a small part of the program during Monday’s holiday observance, organized by UMSL’s Office of Diversity, Equity and Inclusion. 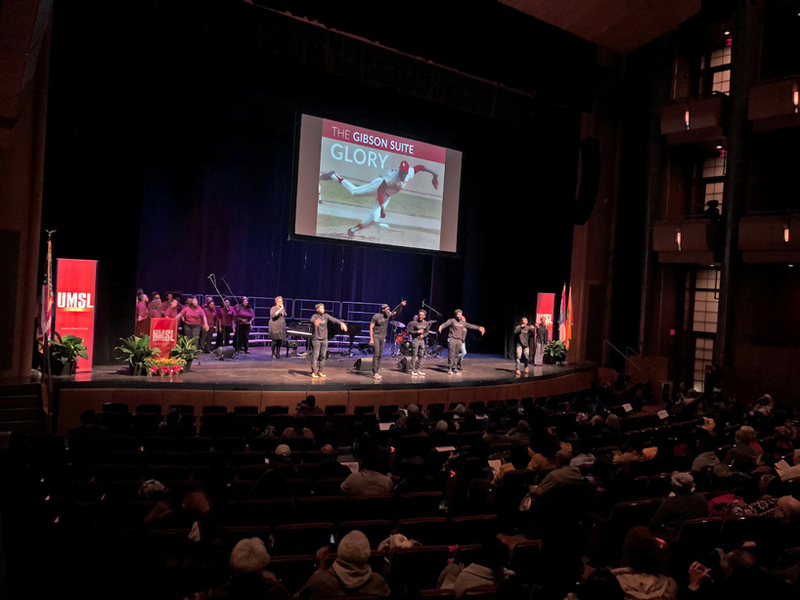 The day featured musical performances by The St. Louis Children’s Choirs and The City of Music All-Star Chorus; UMSL alumnus and Des Lee Fine Arts Collaborative Community Music Artist in Residence Brian Owens, Anita Jackson and the MLK Festival Ensemble; and Owens and Compositions for LIFE. Owens and Compositions for LIFE debuted “The Gibson Suite” about the life of St. Louis Cardinals pitching great Bob Gibson. It followed a moving keynote address from Bree Newsome, a filmmaker, musical performer and community activist, best known for her 2015 act of civil disobedience when she was arrested for climbing the flag pole and removing the Confederate flag from in front of the statehouse in Columbia, South Carolina.